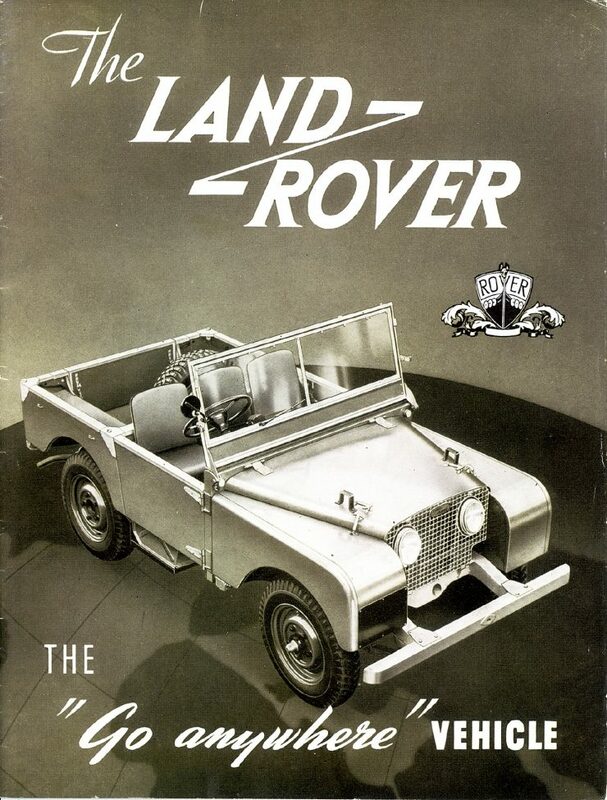 The Land Rover, like the original Volkswagen, has been a car that defied the norms of automotive marketing. The motor industry has been in a mindset of wanting to constantly create a new model, sometimes every year, and lots of variations on that model, seeming to think that people are constantly craving something new: the Land Rover, like the original Volkswagen, demonstrates that it wasn’t necessarily so. It is no coincidence that both the Land Rover and the Volkswagen were created around the time of the greatest war the world has ever seen, and in the aftermath of the Great Depression. Wars and economic depressions educate people to be practical, and to shun fads and fashions. It was that in the aftermath of the Second World War that in typical “Keep Calm and Carry On” Britishness the management of Rover set about planning a new luxury car model for the new post-war era: a new car for the Land of Hope and Glory. Except that Britain’s economy was completely drained by the war, British people were still using ration books for essentials like food and petrol/gasoline, and raw materials were in very short supply. So the notion that Rover could just “Keep Calm and Carry On Building Nice Luxury Cars” proved to be a pipe dream. And so instead the leadership at Rover were pushed into thinking outside the box. For Rover’s ailing account ledgers what happened next had an effect somewhat like the accidental discovery of penicillin. At the end of the war Rover found itself with its original Coventry factory heavily bombed, and needing to move to a shadow factory in Solihull. Rover’s highly skilled workforce was intact and so their ability to get a new car design up and into production was also intact. 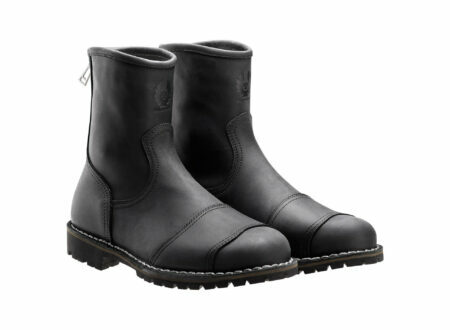 Their initial plan was to create a new model which was to be known as the “M Type”, and they expected to be selling around 15,000-20,000 of them per year. The first reality check came when they did their sums and realized that they could not afford to create a new model, they would have to simply continue to make and sell their pre-war models and hope they could sell the same sort of quantities. Pre-war Rovers were and are absolutely delightful motor cars and were much favored by doctors because of their comfort and reliability. Rover’s hopes were quickly dashed however when the British government told them that Britain could only afford to supply them with enough steel to manufacture 1,100 luxury cars per year. At those low production numbers Rover simply would not survive and her workforce would be making their way to the labor exchange. Rover’s leadership did not panic, the British consider panic to be a terribly un-British thing to do, instead they got their minds working on a way out of their predicament. Rival car maker Standard had been faced with the same set of problems and their solution had been to move into manufacturing farm tractors. Rover’s Managing Director was Spencer Wilks and the Chief Designer was his brother Maurice. Maurice had a farm in Anglesey and on that farm he used an ex-US Army Jeep. Maurice and Spencer grabbed hold of the idea that they could make a vehicle for agriculture and mining industry use that was like a Jeep, but with useful features that the Jeep did not have. Maurice got to work on a prototype. Maurice Wilks quite liked his war surplus Jeep but, as a car designer and manufacturer, he was well aware of its shortcomings and stated that if he couldn’t build a better car that he shouldn’t be in the car making business. 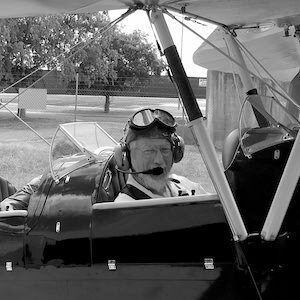 His problems were compounded by the lack of steel available, although aluminum was fairly plentiful, so he would need to use as little steel per vehicle as he could and instead use aluminum alloy for the body panels. Maurice and his team got busy building their first proof of concept prototype on an existing Jeep chassis. Because Maurice was thinking of the car as an agricultural vehicle he placed the steering wheel in the center of the car, a feature that would not make it into the production Land Rovers. Maurice Wilks used as many off-the-shelf Rover car parts as he could in his prototype. The engine was a 1.4 liter in-line four cylinder from the pre-war Rover 10 as was the gearbox, which featured synchromesh on the top two gears and the Rover free-wheeling feature. 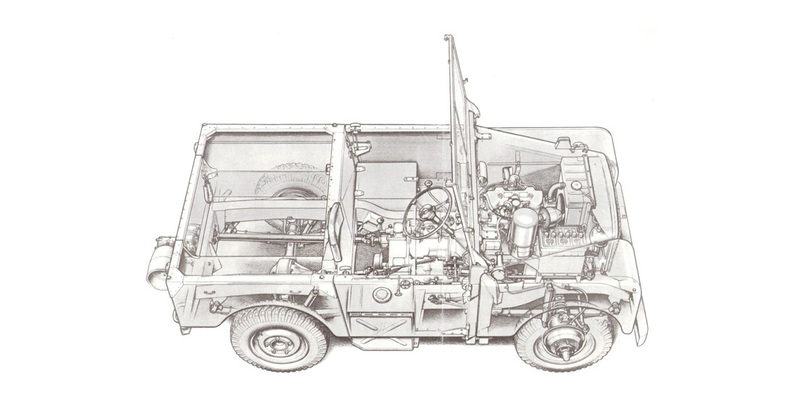 The transfer box was a Jeep unit, and Maurice Wilks ensured that the vehicle was provided with a power-take-off feature to make it more useful in agricultural and mining environments. 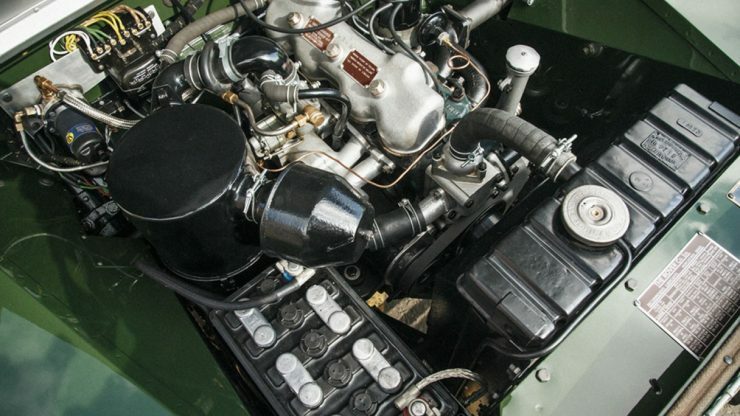 From this first prototype improvements were made which included a Rover made chassis, re-locating the steering position to the conventional position, and a larger 50bhp 1,595cc engine taken from the Rover P3. 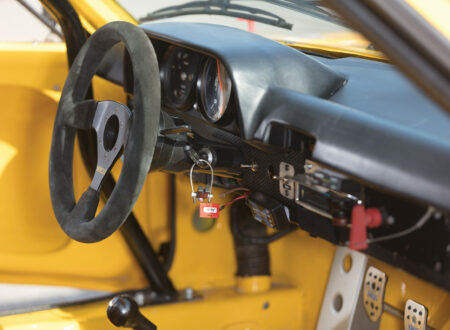 The gearbox retained the free-wheeling feature which disconnected the front wheels when the car was on the overrun, but the Land Rover was fitted with a ring pull to lock the car into 4WD if needed. A new Rover transfer box was created and power-take-off was provided to the front, center and rear of the vehicle. 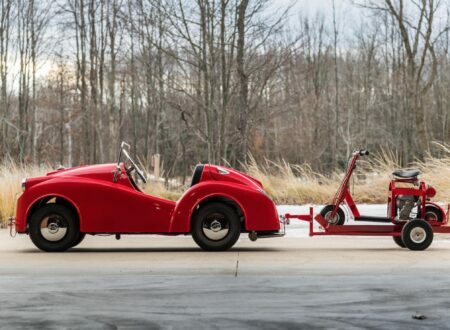 The chassis was a rugged steel box section ladder type whilst the body was made of a British aluminum alloy called Birmabright, which is the same alloy as used for the bodywork of other more exotic British cars such as the Aston Martin. 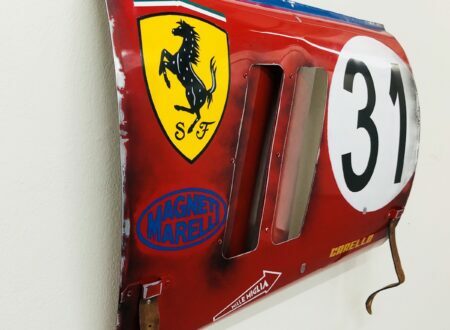 The body panels were kept as flat and simple to fabricate as possible and were attached to the chassis by a steel frame. 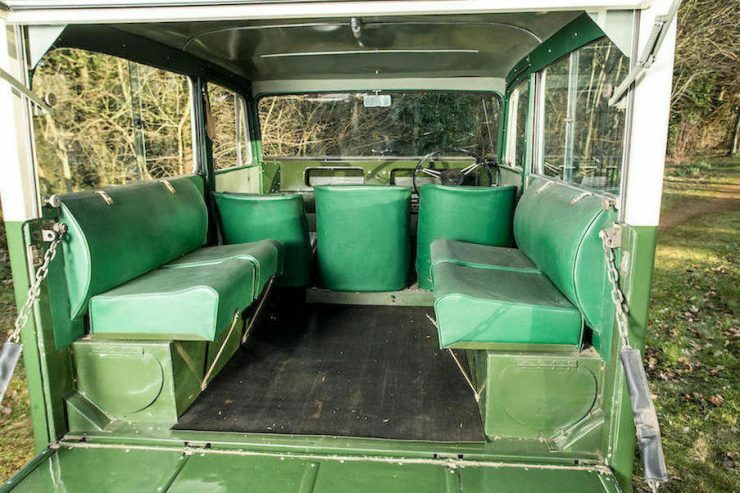 As even paint was in short supply the Land Rovers were offered in “cockpit green” military surplus paint. Fifty of these improved prototypes were made and the car made its debut at the Amsterdam Motor Show in April of 1948. The Land Rover surprised everyone when orders literally came flooding in, to say they sold like little hot-cakes is perhaps an understatement. This car was destined to out-sell Rover’s luxury cars by a factor of two to one. 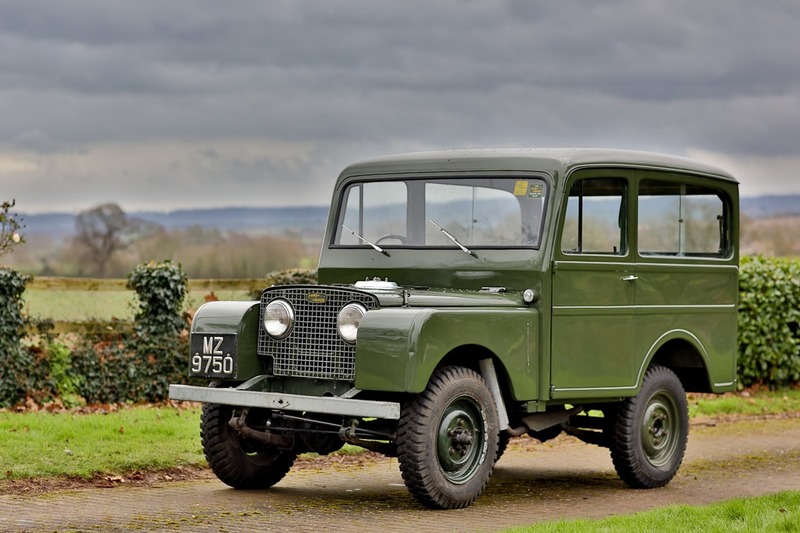 The Land Rover proved to be just the shot of penicillin needed to make Rover’s bank balance look decidedly healthy and this little stop-gap utility vehicle was at the beginning of what would turn into a six decade production run. Rover’s management had hoped against hope that they might be able to sell around 5,000 Land Rovers in the first full year of production. They actually built and sold around 8,000 and the orders just kept on coming in. The Land Rover was purchased by British and overseas farmers and mining companies, as expected, and also by military, police, and rescue services. 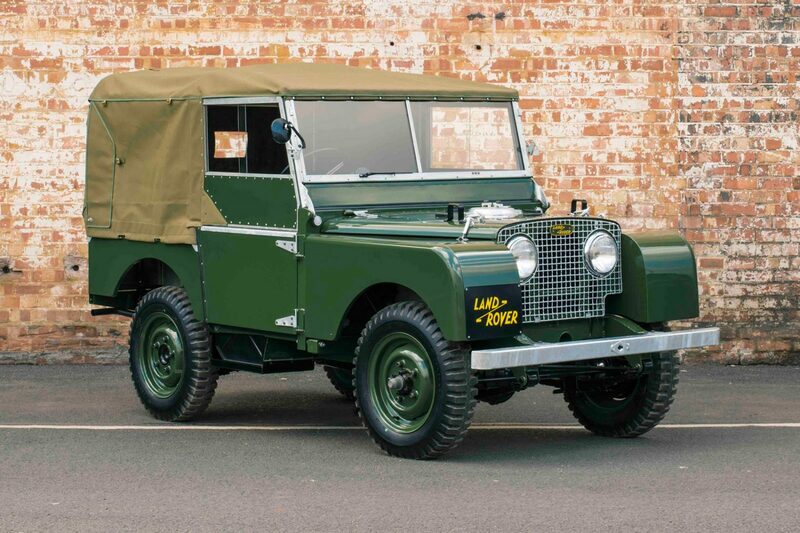 Before creating the Land Rover the Rover Car Company had not been in the business of exporting products much at all. But the Land Rover was a very exportable gem that would find its way to Australia where it would become a backbone vehicle of the Snowy Mountains Hydro Electric Scheme, and to Africa where it would become the iconic safari car and star of movies about exotic African adventures. One of the surprises for staff at Rover was the request for a more luxurious version of the Land Rover. 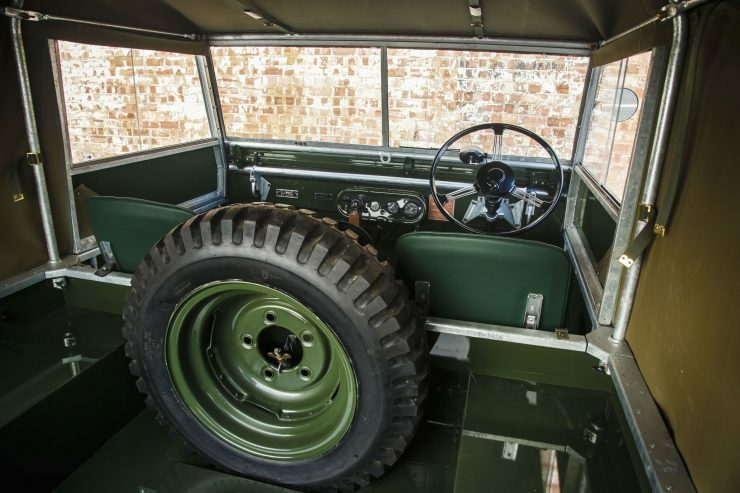 This initially seemed an odd request: the Land Rover had been created to be a cross between a car and a farm tractor so it had not been imagined that customers would want a more up-market version. But when it was realized that Land Rover’s customers often wanted a bit more creature comfort for managers on mine sites, clients on African safari, and sports people needing to be transported around a country estate, then what was needed became apparent. 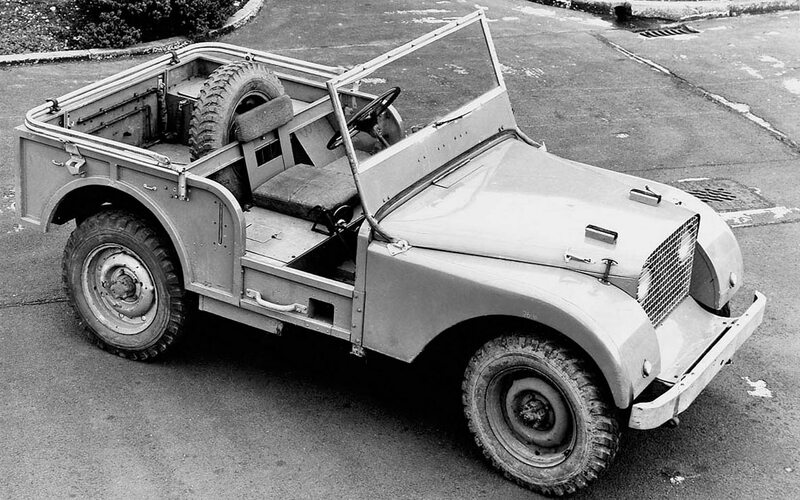 Rover had a long standing relationship with British coach-builder Tickford and so they approached them with a view to having them create a more comfort oriented body for the humble Land Rover. Tickford were happy to oblige and they created a reserved but more comfortable estate car body built in conventional custom coachwork style using an Ash wood frame with Birmabright aluminum body panels. The windscreen on most Tickfords was a one piece laminated glass unit although some were made with a split screen like the standard Land Rover. The interior of the Land Rover Tickford estate car featured leather seats with comfort levels better suited to management level posteriors, and a heater/demister. Because of the imposition of a much higher level of Purchase Tax on the Tickford in Britain, as the vehicle was licensed as a car and not an agricultural vehicle, the Tickfords were mostly sold to export markets with only about 50 of the approximately 700 sold in Britain. Sales in Britain were much lower than they might have been because of the Purchase Tax hiking the price of the Tickford up much higher than an ordinary Land Rover. The Land Rover Tickford remained in production into 1950 before being phased out. Tickford’s in good original condition now have collector value. By 1952 Rover decided to increase the size of the engine of the Series 1 Land Rover; the engine was increased in size to 2 liters (1,995cc). This engine had “Siamese Bores”, which means there was no gap between each cylinder, they were connected together, which of course does not make for the most efficient cooling. In 1952 another improvement was made, the gearbox was strengthened for the new 2 liter engine and was also changed so that 4WD was automatically engaged when low-range was selected: the system incorporating a simple dog-clutch mechanism. With the greater power of the 2 liter engine it was necessary to ensure that 4WD was engaged when the vehicle was put in low-range because the forces applied to the differential and rear axles was sufficiently great to result in axle breakage if the load were not spread between all four axles. Extracting the broken end of an axle from the rear differential was a do-able job but was not particularly easy, and it was of course made much more difficult in places like Africa where there were hungry animals wanting to have a munch on a tasty Land Rover owner. In 1952 Land Rover decided to create their own passenger carrying version of the Land Rover and introduced a seven seat Station Wagon built on the same 80″ wheelbase chassis as the other Series 1 versions. This proved successful but there was a need to increase the space available in the back of the Land Rover, so in 1954 the chassis was lengthened to an 86″ wheelbase, and a long wheelbase 107″ was also introduced. One of the versions built on both the 86″ and the 107″ long-wheelbase chassis was the Safari Station Wagon, the long wheelbase version appearing in September 1955. These were fitted with a “tropical roof”, which is an extra roof fitted on top of the vehicle’s main roof. The effect of this is to make the interior of the car significantly cooler, especially in direct sun, and to reduce condensation in humid conditions. The station wagon was also provided with ventilators in the inner roof to allow air flow. The tropical roof was also available for the 86″ wheelbase Station Wagon. It was just as well that Rover had worked to refine and improve the Series 1 because as a result of a bet made in a bar in Hong Kong a challenge was set up between graduates from Britain’s two most prestigious universities, Oxford and Cambridge, for a 25,000 mile expedition from the north to the far south of Africa, Cape Town, and back again. 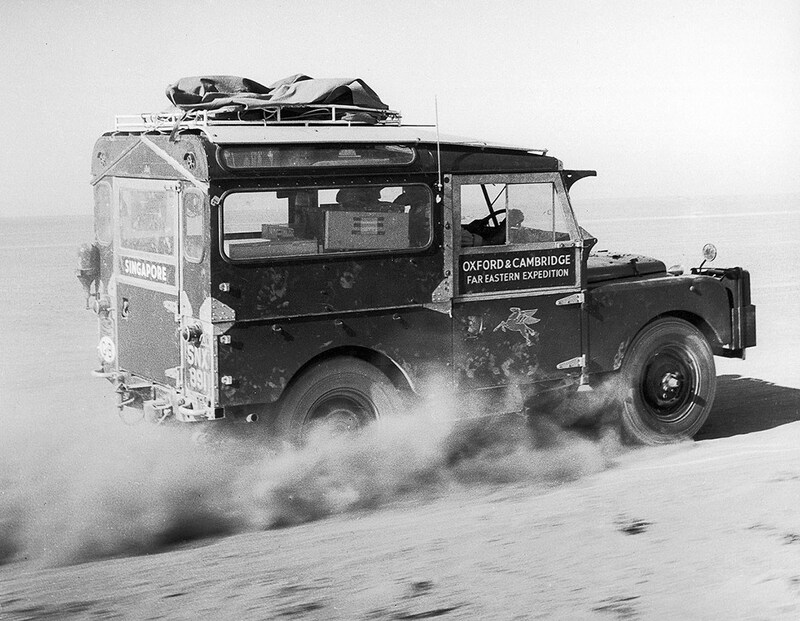 The vehicles of choice for this competitive jaunt were of course to be Land Rovers, and Rover provided two, one for each of the three man teams of each university. After this “Cairo to the Cape” Trans-Africa Expedition in 1954 an even more ambitious expedition was embarked on in 1956 from London to Singapore. 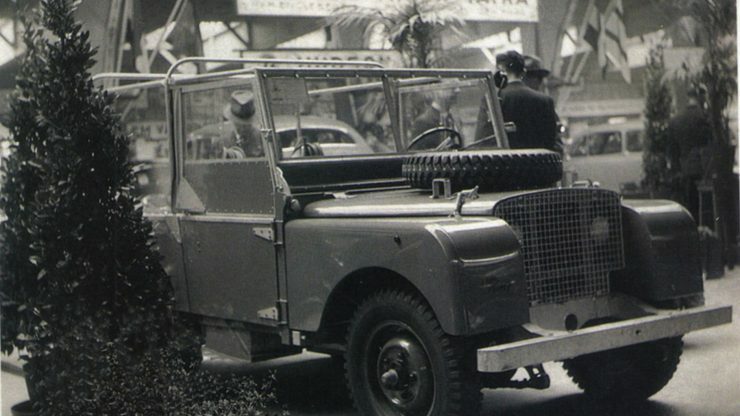 The Land Rovers provided by Rover were the new Safari Station Wagon short wheelbase model, both cars taken straight from the production line. For this “Oxford and Cambridge Far Eastern Expedition” the Land Rovers were fitted with additional 100 gallon fuel tanks, front winches, and jerry-can holders for two jerry-cans on the front. We note that in one photograph (the feature image at the head of this post) one jerry can is marked “Gilbey’s Gin” which we suspect may not be wholly truthful. Storing nice refreshing Gilbey’s Gin in a jerry can would spoil the flavor would it not? The Oxford and Cambridge Far Eastern Expedition was filmed with film provided by the BBC at the behest of Richard Attenborough, and so it became a superb and subtle promotional video for the Land Rover. 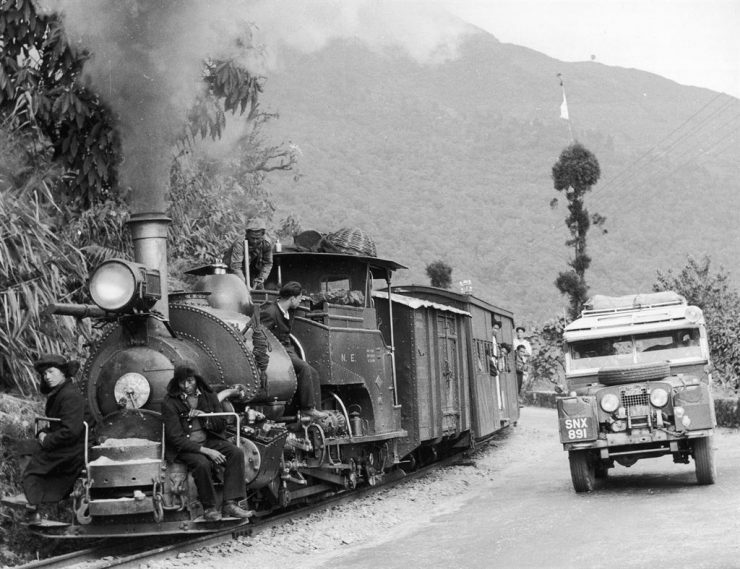 The two expedition vehicles and their crews traveled the route successfully and were the last recorded vehicles to traverse the Ledo Road, between Assam in India and Burma, which had been constructed by US General Stilwell during the Second World War. This was an outstanding “Boys Own” adventure with the teams traversing many places that had previously never been driven through. They arrived in Singapore on 6th March 1956 after their journey of 18,000 miles, and enjoyed a three week break in Singapore before heading back to Britain. 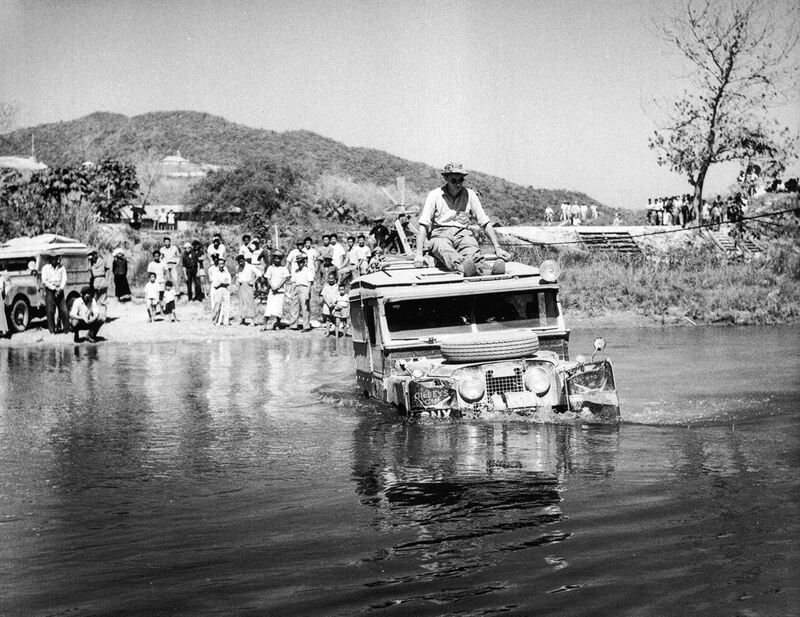 Because of the difficulty and dangers of the route between India and Singapore the two Land Rovers were shipped to India, one to Rangoon and the other to Calcutta, for the journey back. By 1956 customers were telling Rover that they really wanted a diesel engine version of the Land Rover and in order for this to be done the chassis would need to be lengthened again. An additional two inches were added to both short and long wheelbase versions between the front axle and the driver’s toe-board to make room for the OHV 2,052cc, diesel engine which produced 52bhp @ 4,000rpm and was made available in 1957. So the short wheelbase Land Rover was now 88″ and the long wheelbase 109″: dimensions that would remain the same throughout the lifetimes of the Series 1, 2 and 3. The one model that was not changed was the 107″ Safari Station Wagon which was kept in production only as a petrol engine vehicle until 1959, when it was superseded by the 109″ wheelbase Series 2 Station Wagon. 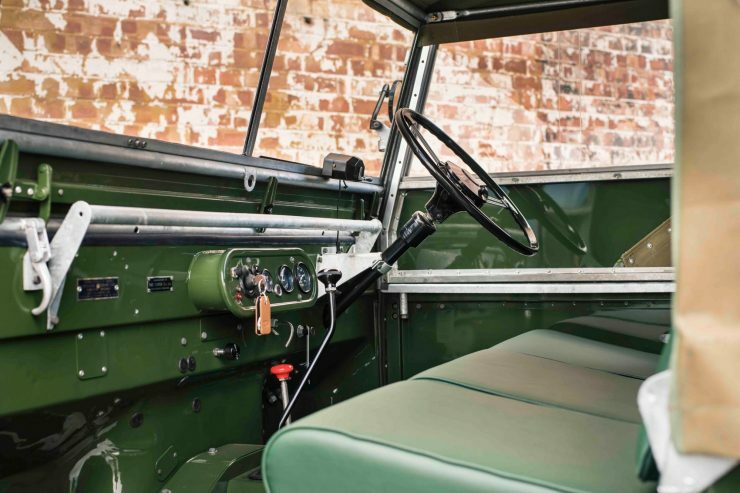 By the time Rover were deciding that it was time to significantly upgrade the Land Rover the Series 1 had laid a foundation as an expedition vehicle, a farm and mining industry vehicle, and as a military vehicle. Even Her Majesty Queen Elizabeth had one for occasions such as military visits and of course it was the perfect vehicle for running around Balmoral. 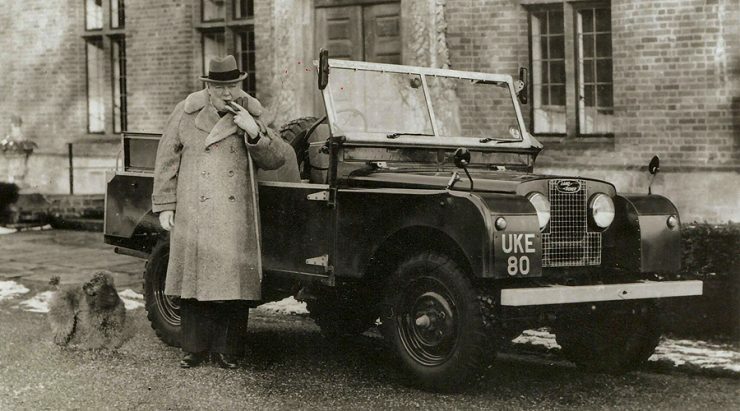 Rover gave a customized Land Rover to Winston Churchill as a mark of appreciation for his self-sacrificial leadership during the war years. So the humble Land Rover had grown up from being a farm tractor substitute to being a car fit for a Queen. It had proven itself and exceeded the best expectations of those who created it, who had thought they would only need to make it for three years or so and then they could get back into being a prestige car maker again. 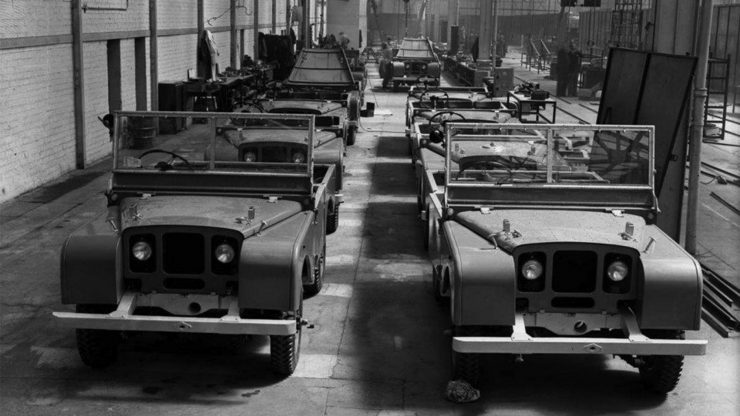 The Series 1 Land Rover was in production for a decade, from 1948-1958, and its last successor remained in production until 2016: that’s a sixty eight year production span at Solihull, where it all began in the aftermath of the Second World War. 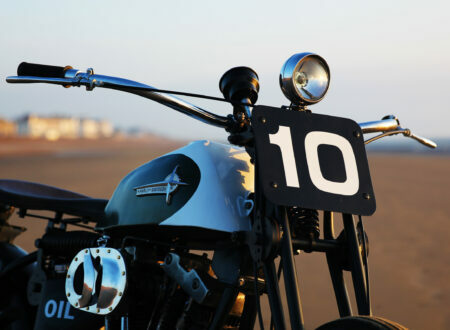 Photo Credits: Land Rover, Bonhams, Silodrome.